The Levine Museum of the New South is a private, nonprofit museum dedicated to preserving and presenting the history of Charlotte and the surrounding Carolina Piedmont. Recognizing the momentous transformation of the Charlotte area since the Civil War, the museum focuses on the historical period known as the "New South," which it defines as encompassing the post-Reconstruction era to the present day. Located at the heart of Charlotte's uptown cultural district, the institution features exhibits, tours, lectures, and programming for all ages. In the summer of 1990, members of the Mecklenburg Historical Association developed the idea of the Museum of the New South and approached Sally Robinson, a community leader and cultural advocate, about organizing the institution. Robinson formed a working group of local historians, university professors, and community leaders to consider the museum proposal. The organizing group settled on the name "Museum of the New South" as a reflection of Charlotte residents' belief that the city exemplifies much of the history signified by that term. The museum was incorporated in April 1991, and a diverse board of trustees was assembled. The board decided that the museum should look at history on a regional scope and distinguish itself from other local history museums by focusing on the "New South" period, that it should rely on current scholarship and be closely associated with area educational institutions, and that it should begin its existence without a building of its own. The decision to operate without a building was made for financial and philosophical reasons. At the time, there was little support in the community for building another cultural facility, and the board felt that operating without a permanent structure would offer tremendous flexibility in developing exhibitions and programs. As a result, for the first four years, the museum was a "museum without walls," mounting exhibits in public places and organizing numerous outreach programs in the community. Among the museum's projects during this period were the exhibitions The Most Democratic Sport: Basketball and Culture in the Central Piedmont, 1893-1994; When Southern Women Went to College, 1880-1930; and Charlotte and the New South: A Region at Work, the latter taking the form of a traveling interactive kiosk. In the spring of 1994, the Museum of the New South engaged in a long-term planning process that identified developing collections and installing a core exhibit as priorities. As a result, with the help of the state of North Carolina and private funding, the museum purchased a building at 324 North College Street in Charlotte's cultural district. After building renovations, the museum opened in January 1996 with the exhibit New South: A to Z. The museum subsequently mounted exhibits about Billy Graham, women reformers, African American churches, and World War II. In 1997 the museum received a $200,000 implementation grant from the National Endowment for the Humanities to prepare its core exhibit. 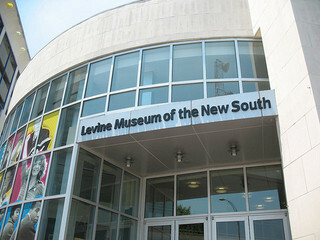 In 2001 the Levine Museum of the New South-renamed in honor of museum patrons Leon Levine, founder of the Family Dollar Stores retail chain, and his wife Sandra-opened in a 40,000-square-foot, state-of-the-art building located at 200 East Seventh Street in Charlotte. Its 8,000-square-foot permanent exhibit, Cotton Fields to Skyscrapers: Charlotte and the Carolina Piedmont in the New South, explores the social history of the economic transformation of the Piedmont from a rural, agriculture-based society to the major financial, business, and industrial center that it is today. Mary Norton Kratt, Charlotte: Spirit of the New South (1992).